APRIL 3, 2019: The state Group Insurance Commission’s annual open enrollment period began today and runs through May 1st. For the 430,000 enrollees insured by the GIC, the open enrollment period allows for changes to be made in choosing insurance providers. 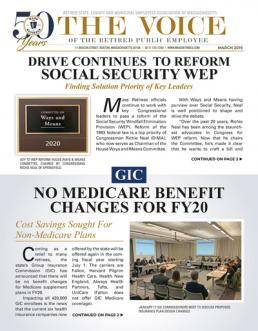 MARCH 1, 2019: On Thursday the state’s Group Insurance Commission (GIC) delivered good news to the more than 82,000 retirees and surviving spouses insured under its Option Medicare Extension (OME) plan. For Fiscal Year 2020, UniCare OME premiums will increase a meager 1.9% over the current year. FEBRUARY 7, 2019: The 17-member Group Insurance Commission (GIC) met this morning to set insurance plan design for Fiscal Year 2020. Plan design encompasses insurance benefits, as well as copayments and deductibles. Insurance premiums are scheduled to be approved on February 28. For the coming fiscal year, which begins on July 1, there will be no benefit or copayment changes impacting Medicare supplement plans. GIC Medicare enrollees do not pay annual deductibles. JANUARY 4, 2019: With potential changes to the state’s health insurance plans set to be announced on Thursday, January 17, the Group Insurance Commission (GIC) has scheduled a “Listening Tour” with planned meetings in Boston, Worcester and Springfield later this month. The three public meetings will take place before the 17-member GIC Commission votes on the proposed benefit changes on February 7 and sets rates for FY20 on February 28. DECEMBER 6, 2018: Today, the state’s Group Insurance Commission (GIC) began the public process of establishing plan design and setting premiums for Fiscal Year 2020. Since all current GIC insurance plans were re-contracted in FY19, Mass Retirees does not anticipate major plan design changes for the coming year. AUGUST 7, 2018: Following several years of increased healthcare costs paid by retirees in their insurance through the state’s Group Insurance Commission (GIC), Mass Retirees called upon the Commission to consider affordability prior to any further increases in cost. For more than a decade, Mass Retirees has fought for an increase in the state’s basic life insurance benefit for retirees and active employees. Our goal is to increase the benefit to $10,000. As members know, the current $5,000 benefit was established in 1985. After 33 years, the benefit no longer satisfies its original intent – to cover retirees’ funeral and burial expenses. According to the National Association of Funeral Directors, costs in Massachusetts well exceed $5,000 and can easily surpass $10,000, even for modest arrangements. JUNE 25, 2018: Despite the best efforts of our legislative team, as well as a wide array of union lobbyists, Mass Retirees’ amendments to the House’s Health Care Reform bill (H4617) failed to be adopted. Of the 171 total amendments filed, only 25 were successfully adopted during last week’s debate in the House. LOCAL & TEACHER RETIREES: WE NEED YOUR HELP NOW! JUNE 19, 2018: Mass Retirees is calling for your immediate help in advocating for our legislation that will permanently protect local retirees from future increases in the percentage of the health insurance premium that you must pay. Today, the House will begin debate on the H4617, a bill relative to healthcare reform in Massachusetts and consider an amendment that provides this basic protection to all local retirees – including retired teachers.